With training camp for the 2014 season underway, the Minnesota Vikings front office and coaching staff are focused on the growth and performance of several young players, such as defensive tackle Sharrif Floyd, linebacker Anthony Barr and quarterback Teddy Bridgewater. Minnesota is loaded with so many exciting young players because the team has made seven selections in the first round since 2012. The Vikings hope that these players can help address the weaknesses that kept the team out of the playoffs last season and in six of the last 10 campaigns. However, several of those early draft selections have little or no experience in the NFL and remain largely unproven as they compete during training camp. In order to improve upon their 5-10-1 record last season, the Vikings must receive significant contributions from their young players. Since many of these players have underperformed or remain untested, a number of Vikings have something to prove during camp. CB Xavier Rhodes: When the Vikings made Xavier Rhodes the No. 25 pick in the 2013 NFL draft, they envisioned him helping to shut down the freakishly athletic receivers of the NFC North. Rhodes must show during camp that he is ready to take a leap forward this season for the Vikings defense to have a chance against receivers such as Calvin Johnson and Brandon Marshall. WR Cordarrelle Patterson: Another first-round pick in 2013, Cordarrelle Patterson showed flashes of explosiveness last season, scoring total six touchdowns in limited playing time. He can make plays as a receiver, rusher or kick returner. In fact, few players were more dominant than Patterson over the final five weeks of the season. Patterson needs to demonstrate that he has developed as a receiver for him to assume the larger offensive role that his talent warrants. LB Chad Greenway: Chad Greenway took a pay cut after a middling 2013 campaign and has just one year remaining on his contract after this season. He struggled in pass coverage and must now adapt to a different role in new coach Mike Zimmer’s scheme. If they cut Greenway after this season, the Vikings would save $7.1 million, making him a candidate for another contract restructure or an outright release, barring improvement. Greenway must prove that last year's subpar performance was due to a wrist injury rather than declining skills in order to secure his future with the Vikings. A fourth-round pick in 2010, Everson Griffen signed a five-year, $42.5 million contract in March. He takes over Jared Allen’s spot at left end despite starting just one game in four years. Apparently, the Vikings saw enough snaps from him in a rotational role behind Allen and Brian Robison and as an interior rusher to present him with a multi-year deal. General manager Rick Spielman is taking a risk in paying Griffen so handsomely considering the lineman's limited playing time and modest overall production. Griffen must immediately prove himself worthy of the deal. After all, Spielman could have used the same money on defensive end Michael Johnson, whom Zimmer coached in Cincinnati as defensive coordinator. The Vikings also need to see him take a large step toward becoming a consistent force on the defensive line. After all, he possesses the power to fight through offensive tackles in addition to the quickness and athleticism to cause serious matchup problems. He even put up eight sacks in a part-time role in 2012. However, he disappeared far too often early last season. The team also needs to him to show that he can be effective with an increased snap count during training camp. He has appeared noticeably larger during camp after staying in the Twin Cities for his offseason workout program, and he must hold up under a more significant workload this season. Kyle Rudolph won MVP honors in the 2013 Pro Bowl, but after being selected in the second round by the Vikings in 2011, he has totaled a modest 1,055 yards and 15 touchdowns in his first three years. To put those numbers into perspective, New Orleans Saints tight end Jimmy Graham racked up more yards and touchdowns in the 2013 season alone than in Rudolph’s entire career. Similar to the team’s decision to re-sign Griffen, the Vikings offered a rich contract to a role player in Rudolph, striking a five-year deal worth a minimum of $36.5 million. As if the 6'6" Rudolph did not already have enough to prove entering his fourth season, his new contract that puts him among the most highly paid tight ends affirms the Vikings' faith that he will develop into a building block on offense. Rudolph must now live up to his contract and demonstrate that he can grow into a premier player at his position. The Vikings have long believed that Rudolph, who focused on a offseason diet that helped him enter training camp at a leaner playing weight of 258 pounds, can become a featured receiver who can catch passes from all spots on the field, in addition to serving as a primary target within the red zone. After releasing backup tight end John Carlson, the Vikings need 2014 to be the year that Rudolph proves his worth. Offensive coordinator Norv Turner’s system features tight ends, and Rudolph must show he can be the next in Turner’s line of great tight ends, succeeding Antonio Gates in San Diego and Jordan Cameron in Turner’s lone season in Cleveland. By selecting Anthony Barr with the No. 9 pick, the Vikings acquired one of the most talented, yet most raw players in this year’s draft class. For a first-round pick, Barr has several aspects of his game that are undeveloped and thus must show that he can handle the learning curve as a rookie. He should make a solid impact as a pass-rusher in his debut season, but he will need time to adjust after being a raw prospect at UCLA. During training camp, he needs to prove he is more than a speed rusher off the edge by adjusting to offensive linemen who will be more capable of countering his pass-rushing moves than those he faced in college. He will have to show that he can handle coverage responsibilities, especially in light of the fact the Vikings have toyed with him on the strong side in their nickel package during camp. He also needs to improve as a run defender, an area in which he struggled at UCLA. It is imperative that he does not get engaged in blocks with a pulling lineman reaching the next level. After playing linebacker for as many years as he played offense at UCLA, Barr must also continue to develop his defensive instincts and show more discipline as a defender. Indeed, at times he can be a “see and chase” type player rather than a “read and react” player, and he often whiffed on ball-carriers in college. If Barr can improve these weaknesses, he should become a three-down linebacker, offering the potential to unlock a series of different looks for the Vikings defense. Sharrif Floyd was taken No. 23 by Minnesota in last year’s draft and already faces an important season in his young NFL career. In 2014, he will take on a more significant role at defensive tackle as he steps into the spot vacated by five-time All-Pro Kevin Williams. During an underwhelming rookie season, he played sparingly, appearing in just 39.6 percent of the Vikings’ defensive snaps. Even when he did see the field, he was largely inconsistent and a ghost at times. He did play in all 16 games but only accrued 19 tackles and 2.5 sacks. That said, he did make some highlights muscling his way into the backfield last year and did just enough for the Vikings to give him a chance to earn a full-time role during this year's camp. The 23-year-old needs to show that he has a more polished game that is deserving a starting spot in training camp, one reason he has worked hard to lose weight during the offseason. “You can see (Floyd) moving around, his athleticism, you can see those things show up a lot more now that he’s lost that weight,” defensive coordinator George Edwards told reporters, praising Floyd’s sense of urgency after dropping down to 303 pounds. Floyd also needs to prove he can take over as one of the leaders along the line. In fact, Floyd has been likened to defensive tackle Geno Atkins, whom Zimmer coached in Cincinnati. This year’s training camp is an opportunity for Floyd to prove he can turn into the kind of 3-technique defensive end that made Atkins a two-time Pro Bowler under Zimmer’s tutelage. Once a consensus No. 1 pick, Bridgewater underwent a predraft free fall following a lackluster pro day that featured him missing open receivers several times. His tumble landed him at pick No. 32, where the Vikings selected him to be the team’s franchise quarterback. First-year coach Mike Zimmer made it clear in June that there will be an open competition for the starting job under center during training camp. The open competition provides the Louisville product with the opportunity to prove that his pro day was an aberration and that he can grow into a better signal-caller than his fellow first-round quarterbacks, Blake Bortles and Johnny Manziel. Specifically, Bridgewater must show stronger accuracy than he did during his pro day, when the timing of his throws was off and some of the balls wobbled into the hands of his receivers. To that end, he seems to be doing well. 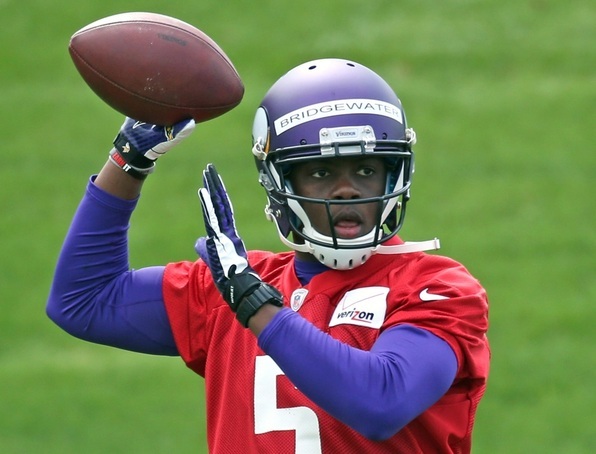 On Monday’s 11-on-11 drills, Bridgewater went 12-of-13, with the only incompletion being a drop. Former general manager Charley Casserly even went as far as saying that Bridgewater looked good enough during Wednesday’s practice to start immediately, noting his good vision and accuracy with the football. All eyes in Mankato are on Bridgewater to see if he can win the starting nod over Matt Cassel and Christian Ponder and show that he can be the Vikings’ future at quarterback.